Amtico, Karndean, Polyflor, Tarkett are some of the manufacturers of Luxury Vinyl Tiles or LVT’s. 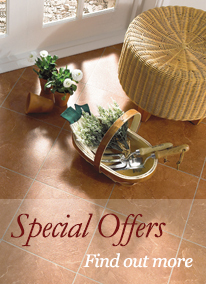 LVT’s are luxury vinyl tiles or planks designed to replica the look of natural stone tiles. Luxury Vinyl Tiles are widely used in both the Domestic and Commercial environment. They are very hardwearing, give a desirable look and are easy to maintain and clean. With wide ranges of wood or tile, differ in size, colour and style, the choice is endless. The practicality of Luxury Vinyl Tiles make them a popular choice for wet areas such as Kitchens, Utility rooms, Bathrooms and Cloakrooms. For more information on Luxury Vinyl Tile Flooring please contact us or call us on 01635 32999 to discuss your requirements.